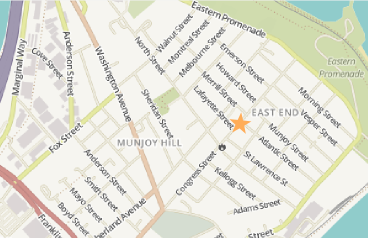 The office is located at 107 Congress Street in Portland, at the top of Munjoy Hill. It is one block from the historic signal tower, the Portland Observatory. The office is on the ground floor, at the corner of Congress and Lafayette Streets. Traveling from north of Portland headed southbound on I-295, take exit 8 (immediately across Tukey’s Bridge) on to ME-26 S/Washington Avenue; continue on Washington Avenue about .6 miles to Congress Street; turn left on Congress Street; continue up Congress Street about .3 miles, past the Portland Observatory (on the right) to Lafayette Street (the next corner, on the left). The door for Chester & Vestal is on the corner of Congress and Lafayette Streets. Parking is usually available on Lafayette Street. Traveling from south of Portland headed northbound on I-295, take exit 7 onto Franklin Street; at the bottom of the ramp, merge right onto Franklin Street and continue straight up Franklin to the 4th traffic light, which is at Congress Street; turn left on Congress Street and continue up Congress Street about .5 miles, past the Portland Observatory (on the right) to Lafayette Street (the next corner, on the left). The door for Chester & Vestal is on the corner of Congress and Lafayette Street. Parking is usually available on Lafayette Street. Take any route in toward downtown Portland. Either get on I-295 and follow the directions above, or continue to Congress Street. Turn left on Congress Street toward the East End of Portland. Continue up Munjoy Hill on Congress Street until you reach the corner of Lafayette and Congress Streets. If you reach the point where Congress Street dead ends into the Eastern Promenade, you have gone too far. Turn around and come back up Munjoy Hill on Congress Street about 6 blocks to the corner of Congress and Lafayette, which will now be on your right. Need assistance? Call (207) 772-7426 and request driving directions. You may also go to google maps at http://maps.google.com/, and click on "get directions." Copyright © 2017, Chester & Vestal, P.A.